Who Cares If You Compose, Milton? Although Babbitt was very defensive about it, claiming that the title of his famous/infamous article published in the February 1958 issue of High Fidelity, “Who Cares If You Listen” (go to page 40/132), was chosen not by him but by the magazine’s editor without his knowledge and consent and that it betrayed the content of the article – it didn’t. Babbitt’s chosen title was “The Composer as Specialist”, and the gist of the article was Babbitt’s contention that avant-garde music was like advanced maths or physics (Babbitt even mentions contemporary philosophy): mathematicians and Einstein didn’t do and publish their research for the layman but for the few highly specialized mathematicians and physicists able to understand it (and it’s no coincidence that Babbitt’s father was a mathematician, and it was maths that Babbitt intended to study when he entered the University of Pennsylvania in 1931). So this is maybe not a case of “who cares if you listen” (although there is some of that), but since Babbitt does explicitly challenge that the average, “uneducated” listener has any legitimacy to state his opinion on modern music, it is certainly a case of “who cares what you think?” The article is ultimately a plea for academic funding of advanced music, irrespective of any public understanding and interest in its productions (and more precisely: because of the lack of any understanding and interest for it from the wider public), on the grounds that research has an intrinsic value, in maths as well as in music. So what Babbitt is saying is “this is not for you, sorry!… this is for my peers! but it has value nonetheless for the world and therefore should be Academia-funded anyway, so that we advanced composers can remain in our ivory tower and do our things among ourselves” (and if you think I’m exaggerating, read the end of the article, where Babbitt advocates a “total, resolute, and voluntary withdrawal from this public world to one of private performance and electronic media, with its very real possibility of complete elimination of the public and social aspects of musical composition”). The article is very perceptive and remains an entirely valid reading still today on the reasons of the chasm between avant-garde composers and the wider public – and it opens no prospect for the chasm to be ever bridged. But the logical flaw in Babbitt’s contention, I think, is that (contrary to what the ancient philosophers, and he obviously, believed), music is not maths, or equivalent to maths. There is indeed an intrinsic social value to “pure” research in maths or physics, even if only a few specialists are able to comprehend it: first of all, even if it remained on a purely intellectual plane, it contributes to our understanding of how the world and cosmos function, and that’s intrinsically good for all mankind; and second, on a more material plane, in the end it always trickles down to usages in the “real world”. No advanced maths and physics, then no satellites, no computers, no internet, no smartphones, no nano-technologies, and so forth. And this is true not just with “hard” science, but with social sciences as well. There is a strong legitimacy then for Academia funding them, and for researchers in those sciences to do their research for their peers and to teach students to become teachers teaching the next generation of students etc., all in what may seem isolation but ultimately isn’t. But what’s the social value of Babbitt’s music? I’m ready to grant that the research of IRCAM, the institute founded in Paris by Boulez, on computer-processes applied to music, has trickled down to applications that have found a wider use than just from the composers of IRCAM – although the importance and value of even those may be disputed, because I’m not sure any has had wide application – pun unintended – outside of the small circle of avant-garde composers using electronics, so it’s kind of a closed echo-chamber. But I may be wrong on this, and who knows if the studios used by rappers or your smartphone don’t widely use technologies derived from those developed at IRCAM. But Babbitt? Has his music contributed to mankind’s better understanding of the cosmos? Have his explorations, “discoveries” (if that’s what they are) and advances trickled down to Broadway, Michael Jackson, Elton John and Snoop Dogg? Good luck on that. But music, pace Babbitt, is not an intellectual tool to better understand and possibly master the world: it is and remains “entertainment”, a production aimed at eliciting enjoyment from a public. At best it is “art” (the difference is intuitive, but hard to define precisely. I’ll tentatively say that “art” is when form is equally or more important than content, when content is pretext and form is text), but even art, however gloomy and dramatic it may be, is meant for the appreciation, enjoyment and enlightenment of those who have a taste for it. Contrary to what Babbitt says, there is not, between music and maths, just a difference in “fields of study”, there is a real difference in nature, and the same arguments cannot be used to defend public subsidization of mathematical research, and of avant-garde composing. A mathematician or physicist pursuing highly arcane research in his ivory tower that only his peers will comprehend is still, nonetheless, working for the advancement of mankind’s understanding of the world; his research is not an end in itself. A composer pursuing his arcane explorations in his ivory tower and composing music so removed from everyman’s concept of music that it will be grasped and maybe appreciated by only a few other composers working along the same lines is only… pursuing his arcane explorations in his ivory tower. It is significant that Babbitt should take his model in science, not art. By the same token, would he advocate funding from Academia to filmmakers, visual artists and writers so that they can freely pursue the most esoteric and arcane productions in their respective art, research for the sake of research, exploration for the sake of exploration, irrespective of any interest from any “wider” public? Logically, he should have, and I bet that, if asked about it, he would have. And after all, there ARE departments of cinema in museums of contemporary art: I know, a friend of mine is the curator at the Musée George Pompidou. Make no mistake: I’m not indicting the avant-garde, on the contrary, I’m a great fan of the avant-garde in general (I listen with pleasure and excitement to the music of Xenakis, Nono, Ligeti, the radical Penderecki of the 1960s and early 1970s and much more that’s “tough-listening”, and sure I can whistle the tunes of Schoenberg as comfortably as those of Beethoven), and I’ve had bickering online disputes with the neo-Beckmessers (I find the word more appropriate than “neo-Philistines”. The Philistines are the true ignoramuses, they don’t even know that they don’t know, and I’m very tolerant with those, after all it’s not their fault. The Beckmessers are the college-trained, who think they know and, because college-trained, that they have a right to make pronouncements of condemnation and that their pronouncements are valid) claiming that the avant-garde – which they usually extend all the way to Schoenberg – is just “elitist intellectual crap”. But, in his effort to liken music and maths, I think Babbitt is using the wrong arguments in favor of the avant-garde and its academic funding. It’s not because it’s like maths, and has the same social value as maths, that it should be Academia-funded. It’s because when the most brilliant and most thoroughly trained minds of an era tackle maths and physics, they become Galileo or Einstein, and when they tackle music, they become Bach and Boulez. Academia has a legitimacy to support both, because it should support and foster the most brilliant productions of the most brilliant and thoroughly trained minds of an era, irrespective of the ability of a wider public to comprehend them. So I’m not sentencing Babbitt’s music and if anybody to blame, it would be myself and the limitations of my hearing. Still, the most off-putting I find with Babbitt’s article is his apparent acceptance of, and satisfaction at, the thought that his music will never attract a public, outside of his likeminded peers. Certainly a contemporary composer, just as any contemporary artist, may wish to pursue a certain logic, based on the in-depth study of all his predecessors, their techniques, their aesthetics, their goals, pursuing or developing certain trends from that past, or voluntarily rejecting them to explore other paths and experiment new forms and new styles. Picasso did that, and so did Jackson Pollock, Jean-Luc Godard, James Joyce or the French writers of “Nouveau Roman”: artists are dwarves sitting on the shoulders of dwarves sitting on the shoulders of dwarves, and the pile of generations builds a giant tower of dwarves. And certainly pursuing those trends rather than seeking the immediate satisfaction of the “wider” public through the repetition of formulas that said public can easily relate to, may result in productions that fail to give immediate pleasure to that wider public, and possibly even productions that will never find the understanding of that wider public: there are still today many who have no understanding for the works of Picasso or Pollock, the films of Godard or the literature of James Joyce and Alain Robbe-Grillet… or even the music of Stravinsky and Bartók. But I don’t think any of these artists were just content to remain in their ivory tower talking only to themselves, pursuing a certain logic for the sake of pursuing it, irrespective of the ability of their works to attract a public beyond the community of their like-minded peers (although recognition often starts there). I think they were all concerned about their work finding a larger public, however “educated” and “elitist” it remained, and furthermore that they all harbored the secret hope that it would attract a very large public. Charles Ives may be a counter-example, who composed for no other public than himself, and decades later his music was recognized as great. But anyway, it came to the mind of none of them, especially Ives, to ask for public or academic subsidies in order for them to pursue their arcane explorations. Reading Babbitt’s conclusion, it seems to me that he’s aware of how otiose his plea is: “Admittedly, if this music is not supported, the whistling repertory of the man in the street will be little affected, the concert-going activity of the conspicuous consumer of musical culture will be little disturbed. But music will cease to evolve, and, in that important sense, will cease to live”. It’s all rhetorical. First, even if music ceased to “evolve” (in the sense of adopting new styles, new methods, exploring new paths; and, since 1958, it hasn’t ceased to evolve, in directions certainly not anticipated, and probably not approved, by Babbitt), it wouldn’t “cease to live”, species don’t cease to live if new species don’t appear, music would continue being played everywhere, even if it was simpler music based on hackneyed formulas. And second, if music ceased to evolve in Babbitt’s sense, frankly, who would care? Who Cares If You Compose, Milton? But Babbitt’s music? Well, for all I know. Type “John Cage” in Amazon.com’s search box under “CDs and vinyl”, you get 840 yields (not all are for different CDs, but it gives a comparative indication). Stockhausen? 565 (Boulez wouldn’t be significant, because it would include all his recordings as a performer). Xenakis, 485. Elliott Carter, 319. Babbitt trails behind, but 201 ain’t such a shameful score. Still, as sympathetic as I am for avant-garde music, Babbitt is part of that small group of composers (others are Wolpe, Wuorinen and oftentimes Carter) who lose me (the jury is still out for me on Boulez and Stockhausen, because I’ve yet to really explore their music). I find that Babbitt’s music often sounds like a caricature of contemporary music, notes here, notes there, as if struck at random. It’s an ironic paradox that the most implacably determined music may sound totally random. Not that Babbitt would have cared, of course: “who cares if you like it”. Still: if Babbitt’s music estranges even the educated listener highly sympathetic to contemporary music, who’s his music for? But every rule has its exceptions, and I’ve found enjoyment in a few pieces of Babbitt. I’ve posted a few reviews of Babbitt’s music on Amazon.com which I need to transfer over here, some expressing my puzzlement, some my enthusiasm, but so far the only one I’ve posted here is for his All Set for Jazz Ensemble, on Spectrum: New American Music. Works of Stefan Wolpe, Seymour Shifrin, George Rochberg, Milton Babbitt, Richard Wernick. The Contemporary Chamber Ensemble, Arthur Weisberg. Elektra Nonesuch 9 79222-2 (1990), one of Babbitt’s most accessibe and enjoyable pieces I’ve heard. More resources on Babbitt start, as always, with the invaluable Wikipedia entry. 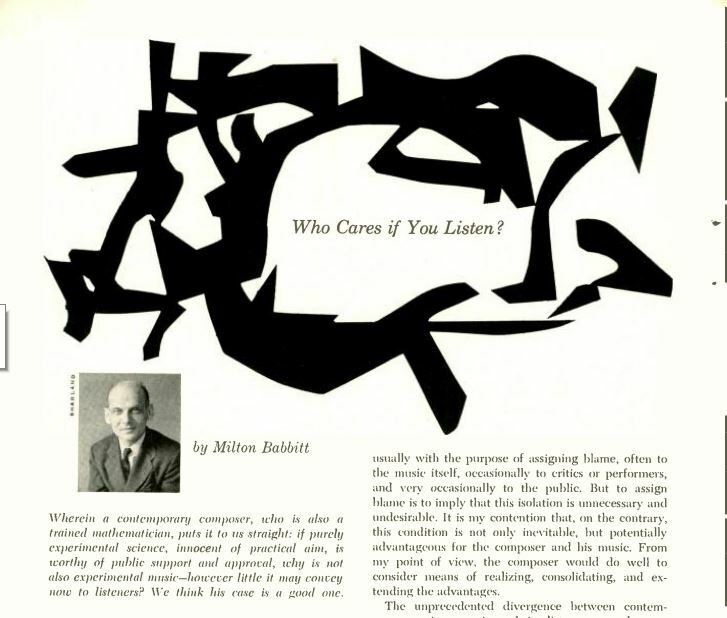 There’s an excellent enty also especially on Babbitt’s fateful article, “Who Cares If You Listen”.